Brian72, ncpete and redheadwoodshed like this. ncpete and cheeves like this. Check out the McCulloch sticky, plenty of those saws on there. Pound for pound, one of the loudest saws out there...seems the combination of the RPM/pitch and the location of the muffler makes these very powerful (dbA anyway) saws. I took the reeds off of my Mac4300. I ran it. I put the reeds back on my Mac4300. My first lesson with a saw was on my Grandfather's Mac 10-10A over thirty years ago. The saw sat for a number of years while I was in college. I came home put some fresh fuel in it and it fired right up. I still run the saw today; however occasionally for sentimental reasons and of course the sweet roaring tune it produces. No other saw sounds like the ol' Mac. Running the Mac 10-10A for any length of time results in hands still shaking hours after its use. I plan to restore the saw someday to pass onto my son with hopes he will appreciate the decades of work his forefathers put behind that saw. I just hope parts will still be available. The best part of the 10-10 was its offspring. especially the 82cc big brother. I reckon the 10-10s counts doesn't it? Got 2 of 'em and yea,they're loud but can still hold their own as firewood saws. wudpirat and redheadwoodshed like this. Hey Dan, nice to hear from you again. 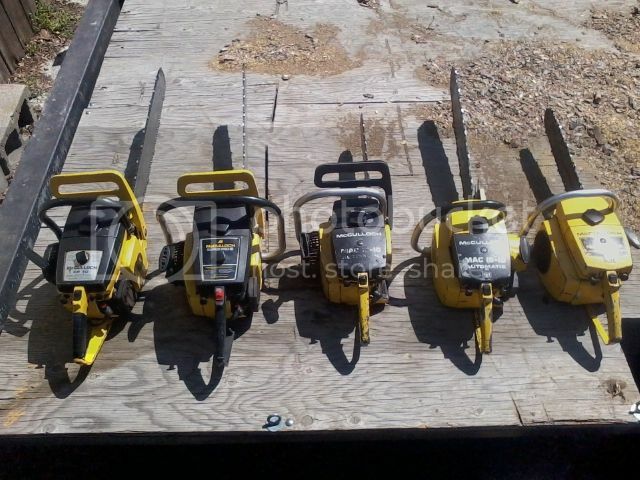 If you want to see a 10-10 die just let my son Jeff use it, that is why he keeps the 600 Series saws for me. I have been wanting a Mcculloch, I have yet to decide on a 10-10 or do I want something bigger? Or maybe better yet maybe both. Growing up in a Homelite home, I was always taught Macs were junk.I took one on a trade more or less out of curiosity.The saw (Pro-mac 10-10)had been sitting so long the chain was rusted to the bar on bottom and the engine was locked up.After a few days soaking in MM oil I was able to free the piston without breaking a ring.I put in some gas and oil and fixed the recoil spring.After about 100 pulls it fired up.After a carb kit it only takes 2 or 3 pulls.That is one stout saw.I like the option of the manuel oiler and I like the way it sounds, with earplugs of course!Soon I found a 10-10S and keep my eye out for more. I have a few Stihls, Homelites, Poulans and one Husky, but I grab one of those Old Yellers first when I need a saw. They are a tough little saw. I've been a fan for years, of all of the 10XX series, as well. Try to avoid the temptation to run 'em too lean tho. Or you'll have a nice yellow door-stop. You could just get a PM700, looks like a 10-10 but it's bigger inside.. I bought mine for $5 from a mower shop. You just have to keep looking, they aren't seen every day like the 10-10 is but they're out there. Ebay might be a good place to look, they have them occasionally. I have 7 of the 10-10 series in various stages of repair, 4 of the ProMac 10-10, 3 of the 10-10a, all of my neighbors know when the 10-10's are up and running, they enjoy the sound----from a distance. They truly are a saw that doesn't want to die.